Lewiston is a rural mill town in Central Maine. Several years ago, Somalis throughout the United States got word that Lewiston offered a combination of good schools, plentiful housing, and generous welfare benefits. And the influx began. The Mayor has asked Somali leaders to stop bringing in additional immigrants as the City’s budget is buckling under the pressure of the largely unemployed Somalis. New arrivals are still arriving weekly. Downtown is pretty much written off. Dozens of building sit vacant. The Pizza Hut is shut down. Several work crews were noted. 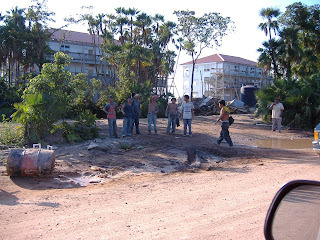 Jobs included paving preparation, water and sewer maintenance, and the construction of a new structure. All workers were Caucasian, each paying over 8% of their income to the state of Maine in order to support it's entitlement programs. Somalis like the City’s park. They tend to group themselves and remain stationary. Most head scarves were the colored kind. Only two of the women wore the straight black burkas. This evening, as some type on keyboards, thousands of men will put on boots and helmets. They will go out into the Arab streets and look at the faces. They will follow their orders because it is their job. And the odds are that several will not be alive tomorrow. God bless the men and families who are making the sacrifices. 29MAY Update: Ten men were killed yesterday. The binding energy per nucleon per nucleon is the force holding atoms together. Setting aside the spiritual, the universe revolves around nucleonic binding energy. Atoms are ‘tightest’ at an atomic weight of around 60. Heavy atoms like Uranium are ‘loose’, containing extra energy. This energy can be released by splitting the atom and creating more stable elements with lower weights. Fission bombs release this energy in war; fuel rods release this energy to create electricity. The energy released by fission pales in comparison to the energy released by fusion. Our sun creates energy by pushing hydrogen atoms together, sustaining life on earth. After the hydrogen is gone, the star dies and goes cold. Thermonuclear weapons also push together hydrogen atoms. In effect, a thermonuclear explosion is a small sunspot on earth. Iran is attempting to create a 15-kiloton fission weapon. Fusion weapons are used by the US and Russia. A typical 1950s ICBM weapon yield was 3.6 megatons (3,600-kilotons). Russia exploded a 56 megaton (56,000-kiloton) weapons in the 1960s. In 1907, cars were rare, airplanes were a novelty, and most people made their living on the farm. The rural electrification programs didn’t happen for another thirty years, so most people living outside of the city had no electricity or indoor plumbing. America was the land of opportunity, but if you didn’t earn a living, you went hungry. In 1949, Orwell warned of the ‘Problem of Overproduction’ with the advent of the mechanized age. And for the last fifty years, the Problem of Overproduction has created such surpluses that our society has been able to do amazing things. We’ve put a man on the moon, curtailed childhood mortality around the world, and packed pounds on the non-productive. It’s been a stunningly successful Century for mankind. But now the game changes. The United States’ government is bankrupt, as is most of the Western World. The wealth now resides in concentrated form with individuals. That is the setting as we move from Orwell’s ‘Problem of Overproduction’ to the 21st Century’s ‘Problem of Underproduction’. I went to visit my Senator’s branch office today to meet with my ‘Regional Representative’. He was talking with a friend on the phone when I stepped into his doorway and said ‘knock, knock’. I introduced myself and we made 30 seconds of niceties. When asked about the Senator’s position on the pending immigration legislation, the Regional Representative looked sort of scared as he explained that the Senator hadn’t made any decisions yet and was thinking about things. His hands were busy with a pen. He’ll hand my letter to the Senator. She reads them all. My Senator is on the Finance Committee and I asked about Senator Coburn’s estimate of $3 trillion in annual unfunded liabilities in Medicare and Medicaid. The Representative looked confused, pulled out a yellow sticky, and wrote the figure $3 trillion a year. Question mark. He’ll ask. When asked about the Senator’s availability to meet with constituents, nobody had ever requested that and the Senator is very busy. "At first we thought it was a joke when we received a letter with a mixture of threats, mentioning Al-Qaeda and full of spelling mistakes," said Chantal Tenot, the festival's press officer. But after several threatening phone calls the organisers decided Friday to file a police complaint and call off the event. Paris anti-terrorism investigators have been alerted and the festival organisers are to meet foreign ministry officials on Monday to discuss the situation, Tenot said. She said the organisers hoped to reschedule the festival -- which last year drew 15,000 visitors -- in the autumn. Good luck Ms. Tenot. Those who cannot build shacks may just be able to tear down cathedrals. But they can’t win. Unfortunately, there is only one way to oppose a threat that talks like men, fights like women, and hides behind children. We went after a Serbian a decade or so back who understood the dilemma all too clearly. Two job descriptions have created the United States in its current form. 1. A politician’s job is to get re-elected. 2. A business leader’s job is to maximize shareholder return. These two jobs are now filled with skilled professionals. Add universal voter eligibility and those claims about the end of history sound kind of silly. The Nurturing Age (1965-2015) was known for its compassion and freedoms of thought and movement. The surpluses of the Post-War West were in large part allocated in efforts to equalize the intellect and industry of all people. The Nurturing Age was brought to a close as higher-income members of the West fled confiscatory rates of taxation, bankrupting the mechanisms put in place to support the social welfare of the population. The close of the Nurturing Age was marked by violence in the West and famine throughout Africa and the Middle East. NOW HERE'S a little flash! Bill and Hillary Clinton have their eyes on the ball when it comes to 2008, but in the meantime, has anyone noted that they bought a piece of beach property in the Dominican Republic right next to the beautiful domain of designer Oscar de la Renta and his wife, Annette? Wolfowitz raised Shaha’s salary from $133,000 to $193,590. You see, they’re in it for the children. And, by the way, you’re picking up the tab. For the children of course. As the US electorate targets those 10% who are pulling the wagon, watch for the Caribbean and Central America (Belize, Costa Rica) to boom. Taxes are near zero and businesses that make money and hire locals are celebrated. 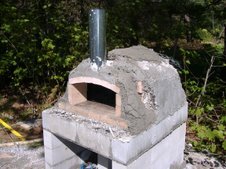 Wood-fired brick ovens are more complex than your standard kitchen oven. 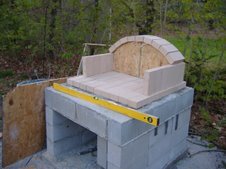 Modern brick ovens consist of several parts; the base, the chamber, the roof, and the door. The base acts as the interface with the earth, a chamber for the conditioning and storage of wood fuel, and an insulting blanket to minimize heat loss from the oven’s chamber. It is essentially a steel-reinforced masonry chamber. The insulating blanket is provided by including a layer of lightweight sand below the surface of the chamber. Sand has a low coefficient of thermal conductivity, resulting in a high temperature drop across the layer, maintaining the oven’s heat. The chamber is typically in the form of a tunnel or a dome. These forms provide structural stability as well as concentrating the radiative heat energy on certain areas of the floor of the chamber. 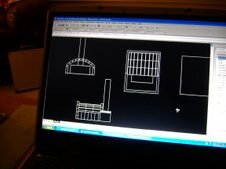 The chamber is constructed with refractory materials; either fire brick or refractory mortar. Food is cooked directly on the floor of the chamber. Because of the high temperatures that brick ovens operate at, the oven burns off any oily deposits and is self-cleaning. A large mass of concrete is placed above the chamber, forming the roof. The concrete absorbs the heat that passes through the top of the chamber. 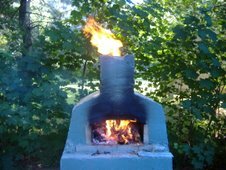 The energy contained in this heat is radiated downward back into the chamber, cooking food even in the absence of flame. The more concrete, the more energy is retained. Because of the potential for differences in thermal expansion, a membrane is placed between the refractory masonry and standard masonry materials in the concrete mass. The Chimney-Door assembly is the opening to the oven. The opening is extended in order to allow the placement of a chimney at a high point that vents exhaust gases up and away from the baker’s face during operation. The height of the door is lower than the height of the chamber. The difference in height creates a heat pocket in the chamber, allowing the energy from the fire is transferred from the exhaust gases, through the chamber, to the concrete mass of the roof. The ratio of the door height to the chamber height should be approximately 0.62 for effective operation. A metal door cover can be placed to retain heat with in the chamber. Brick ovens are extraordinarily energy-efficient devices. Compare the efficiency of a standard electric range with that of a brick oven. Electric ranges use electricity. Electricity is made by burning fuel, heating up water, and spinning turbine generators. The process has a thermal efficiency of around 33%, meaning that two-thirds of the energy used in the generation of electricity is wasted. Following power generation, more energy is wasted in line losses during transmission from the power plant to your house. Once inside your house, more energy is wasted during cooking. After all is said and done, perhaps 15% of the energy put into the electrical generation plant ends up cooking your food. Your Weber grill is lucky to hit 10%. In comparison, a properly operated brick-oven’s energy efficiency is up to 90%. And the fuel comes from fallen wood in your backyard. 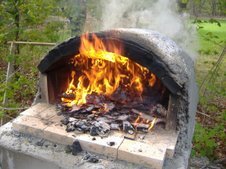 Conduction, Convection, and Radiation: Why brick ovens are better. The oven in your kitchen operates by conduction. If you turn the temperature to 425F, the air within the oven heats up and food in the oven slowly comes to temperature as the heat is absorbed. Since the air within an oven is relatively still, a ‘temperature gradient’ develops around the food, acting as insulation and slowing the cooking process. High-end commercial pizza ovens offer blower-based convection technology. A convection oven passes moving air over the food to cook it. By using moving air instead of stagnant air, the temperature gradient surrounding the food is greatly reduced, cooking is made more rapid, and most pizza purveyors consider the finished product to be of a higher quality. The venerable brick oven does one better. 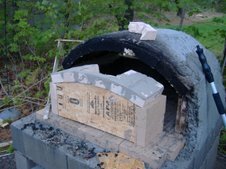 The brick oven itself is a natural convection device. Air is drawn into the bottom of the chamber and moves to the flames. The exhaust gases from the fire at the rear of the stove rise to the top of the chamber, move forward towards the front of the oven, down to the chimney-door assembly, and then up the chimney. No blowers required. 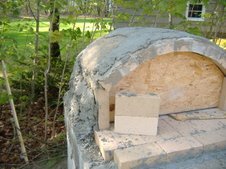 In addition to the natural convection feature of the brick oven, the extremely hot surfaces of the chamber create a significant amount of radiant heat. Radiant heat transfers energy through natural electromagnetic radiation, similar to how the sun heats the earth, or how a steakhouse broils a steak. 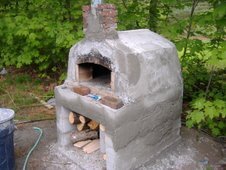 A brick oven utilizes both convection and radiation as cooking mechanisms, creating excellent food. It usually all boils down to money. The link has government bond rates for various industrialized countries. Its interesting that Wall Street deems western countries to be three times as risky as Japan. My theory is that the fact that the Japanese have shown a propensity to disect live prisoners has something to do with the stability of their financial systems in the eyes of analysts. Lending money to the US is riskier than lending money to Europeans. Note how yields are going up and to the right for everybody since 2005. Mostly theraputic. I’ve come to the conclusion that the current form of American government is teetering towards eventual failure, and subsequent reformation, sometime in the next twenty years. News events are fun to watch, but are also kind of sad as the hard work of so many is set aside so that the forces that be can make a go of things. They won't like what they create. This is a chronicle of future news items with commentary.